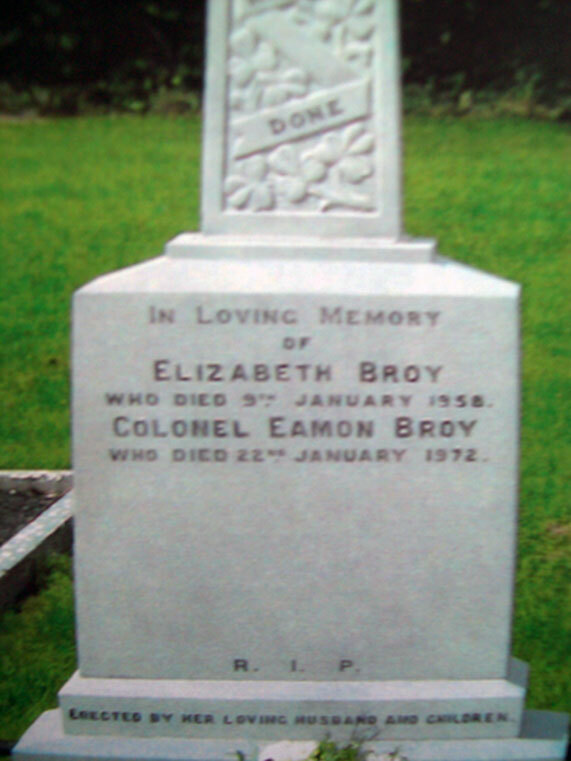 Colonel Eamon Broy (often called Ned Broy) (1887–1972) was successively a member of the Dublin Metropolitan Police, the Irish Republican Army, the Irish Army, and an Garda Síochána. He served as Commissioner of An Garda from February 1933 to June 1938. During the Irish War of Independence (1919–21), Broy was a double agent within the Dublin Metropolitan Police (DMP), with the rank of Detective Sergeant (DS). He worked as a clerk inside G Division, the intelligence branch of the DMP. While there he copied sensitive files for IRA leader Michael Collins. On 7 April 1919, Broy smuggled Collins into G Division’s archives in Brunswick Street, enabling him to identify “G-Men”, six of whom would be killed by the IRA. Broy supported the Anglo-Irish Treaty of 1921 and joined the Irish Army during the Irish Civil War, reaching the rank of Colonel. In 1925, he left the Army and joined the Garda. Broy’s elevation to the post of Commissioner came when Fianna Fáil replaced Cumann na nGaedhael as the Government. Other more senior officers were passed over as being too sympathetic to the outgoing party. In 1934 Broy oversaw the creation of the “The Auxiliary Special Branch” of the Garda. This was formed mainly of hastily-trained anti-Treaty IRA veterans. It was nicknamed the “Broy Harriers” by Broy’s opponents; a pun on the Bray Harriers athletics club. It was used first against the quasi-Fascist Blueshirts, and later against the diehard holdouts of the IRA, now set against former comrades. The “Broy Harriers” nickname persisted into the 1940s, though Broy himself was no longer in command, and for the bodies targeted by the unit was a highly-abusive term, still applied by radical Irish republicans to the Garda Special Branch (now renamed the Special Detective Unit).The Broy Harriers engaged in several controversial shootings, which resulted in death. They shot dead a protesting farmer called Lynch in Cork. They were detested by sections of the farming community. Broy was President of the Olympic Council of Ireland from 1935 to 1950.